Among the casualties of the March 11, 2011, earthquake and resulting tsunami in Japan was the country's Fukushima Daiichi nuclear power plant. A result of the loss of electricity, overheating at the power plant led to significant releases of iodine, cesium and other radioisotopes to the environment. Japanese officials recently raised the severity of the nuclear power plant incident to level seven, the highest level on the international scale and comparable only to the Chernobyl incident 25 years ago, said Ken Buesseler, a chemical oceanographer at the Woods Hole Oceanographic Institution. "When it comes to the oceans, however," said Buesseler, "the impact of Fukushima exceeds Chernobyl." Radionuclides in seawater have been reported from the Fukushima plant's discharge canals, from coastal waters five to 10 kilometers south of the plant, and from 30 kilometers offshore. "Levels of some radionuclides are at least an order of magnitude higher than the highest levels in 1986 in the Baltic and Black Seas, the two ocean water bodies closest to Chernobyl," said Buesseler. He has been awarded a rapid-response grant from the National Science Foundation's (NSF) Division of Ocean Sciences to establish baseline concentrations of several radionuclides in the Atlantic and Pacific Oceans. "Finding this information early on is key to understanding the severity of the releases and related public health issues," said Buesseler. He and colleagues will establish a baseline radionuclide data set for the Atlantic and Pacific Oceans, using an east-to-west network of sampling stations where the ability to retrieve ocean water samples already exists. Researchers learned much from Chernobyl about the fate of radioactive falloutdelivered to the oceans, and about using that fallout as a "tracer" for how fast ocean waters mix and sediments accumulate. "After Chernobyl, fallout was measured not only in samples close to the site, such as those in the Black Sea, but as far afield as the north Pacific Ocean," Buesseler said. Because the atmosphere and oceans are linked, scientists would expect radionuclides present in the atmosphere also to appear in the ocean, albeit at very low levels, said chemical oceanographer Henrieta Dulaiova of the University of Hawaii. Dulaiova has also been awarded a rapid-response grant from NSF's Division of Ocean Sciences to study the fallout. She is monitoring ocean waters to establish baseline concentrations of radionuclides, and to determine the spreading of released radionuclides. "Like the people of Japan--though certainly to a lesser degree--we are dealing with a radiochemical situation that will be with us for a long time," said Don Rice, director of NSF's chemical oceanography program. "To understand how the ocean and atmosphere have handled this contamination in the years ahead, we must first get a snap-shot of the situation today," said Rice. "Buesseler and Dulaiova are doing just that." Dulaiova's study is focused on the central Pacific Ocean, and includes coastal and offshore waters off Hawaii, Guam and the Midway Islands. "Hawaii's proximity to Japan makes it an important monitoring point," said Dulaiova. "We're conducting weekly coastal and monthly offshore water sample collections." Bi-weekly samples from Guam are also collected, and samples are obtained from ships cruising the western Pacific. The samples are then analyzed for cesium isotopes, whose signature allows scientists to identify radionuclides released from Fukushima. Dulaiova is also planning to look at other radionuclides such as iodine, strontium and some actinides that were released. "The information is needed," she said, "so that any subsequent efforts to understand the severity of the releases, the bioaccumulation of radionuclides in the ocean food web, and ocean processes and spreading patterns of the released radioisotopes, all have good baseline data." 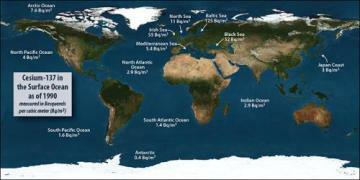 The researchers hope to develop an understanding of marine radionuclides on a global scale.